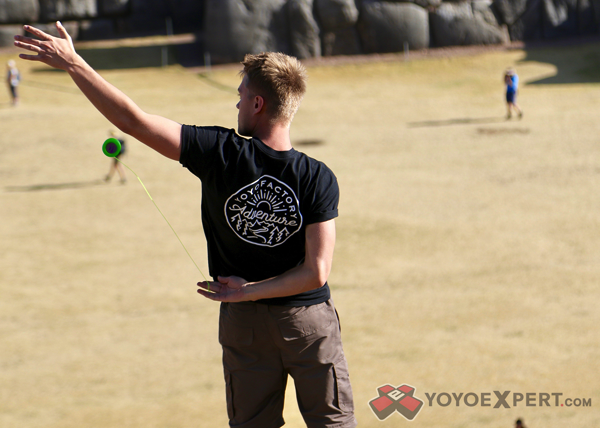 YoYoExpert Blog & Yo-Yo News – Join the Adventure! 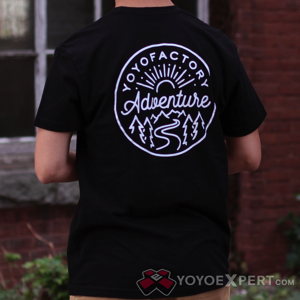 Join YoYoFactory in their pursuit of Adventure with the all new Adventure T-Shirt! “The Yo-Yo industry is cozy small. Its a community. One of our goals as a company is to try to have a positive influence on that community. Yo-Yo is so many different things to so many different people. It’s an identity, a creative outlet, a sport, a hobby, a passion. We support competitive yo-yo as a way to continue the progression of yo-yo trick development and performance. In 2015 we formalized another way we wanted to promote yo-yo and that was as a vehicle for Adventure. Usually our adventures are on the way to or from somewhere that we need to be for other reasons. Sometimes adventure is enough of an excuse itself. Printed on a super soft Next Level cotton shirt, the YoYoFactory Adventure T-Shirt is ready to take on any journey!